Like many ambitious students at the UC San Diego School of Global Policy and Strategy (GPS), Frederick Hemans hit the pavement early in search of a summer internship. Unlike others, he not only received an internship offer in his first quarter but, with help from his summer employer, already wrote a paper that’s attracting attention on the East and the West Coast. 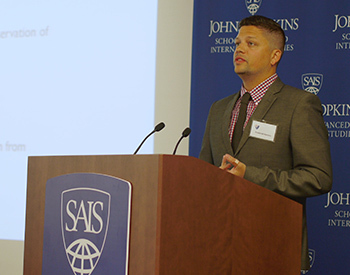 In April, the 2018 MIA candidate presented “China’s Increasing Role in Antarctic Marine Conservation in the Wake of U.S. 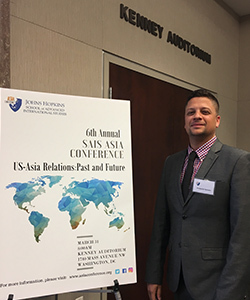 Leadership Change” at both the John Hopkins School of Advanced International Studies’ (SAIS) Asia Conference and at the Association for Public Policy Analysis and Management’s (APPAM) California Regional Student Conference. The paper, Hemans explained, was born out of his networking efforts with a fishery manager at the Commission for the Conservation of Antarctic Marine Living Resources (CCAMLR). He called it “serendipitous” that SAIS and APPAM were calling for papers around the time his wheels were turning about this topic. And so, he cranked out 29 pages on his laptop over winter break, continuing to bounce data and ideas off of his contacts at CCAMLR, and crossed his fingers that one of the conferences would value his work. Given shifting environmental priorities in the current U.S. administration, Hemans added, he sees it more important than ever to inform and encourage other global actors to have a stake in marine conservation — no mind if that information comes from a graduate student. Undergoing the School’s Quantitative Methods sequence during this time, Hemans said, helped him comprehend the data in ways he wouldn’t have been able to before attending GPS. Honing in on China’s role was a natural extension of his studies, too, given it’s his regional specialization at GPS. Plus, Hemans lived in Beijing two years before completing his undergraduate studies at San Diego State University. He also resided in New Zealand, which neighbors Antarctica, ahead of applying to GPS. Moreover, Hemans said, writing and disseminating this work adds to his broader career goals. On a forward-looking note, Hemans said his summer internship with CCAMLR could inspire more notions to put to paper. Based in Tasmania, he will be developing a proposal for the European Union to fund an advance radar system to track illegal fishing in the Antarctic sea.